Early yesterday morning I went out to photograph our highly unusual snow fall. As a bonus, I got a close up shot of a warbler. When walking the dogs, I always see them flitting around in the Wax Myrtle shrubs but, they are far to fast for me to clearly see any field markings. Back to the warmth of our home I went, husband and dogs still tucked warmly in bed. Photographs were downloaded and at long last, I was able to I.D. this little one. Yellow-rumped Warblers, Dendroica coronata, love open brushy habitats and especially fruited trees. The small loose flocks that I always see, in the winter, are eating the wax myrtle berries. 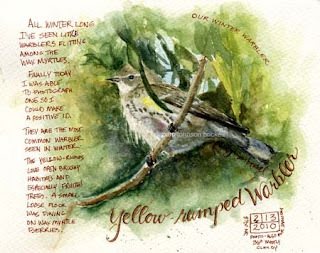 No wonder they are the most common warbler of our winters. Wax myrtle's are everywhere and are always loaded with berries. Beautiful Pam! I don't know how I've been missing your last posts but they've been wonderful. I love the photos of the snow too. Very nice, and accomplished, watercolor Pam! We see hundreds of these guys at Cape May in the fall, doing the exact same thing. What a little beauty and you captured him perfectly, using the darks behind him to really set him off. Glad the snow hasn't put you off. Lovely page! Love the way the writing curls around your sketch! And a nice payoff for getting out of your warm bed!! Wow beautiful bird, nice job there :D:D, u have great works here in your blog, contragts ! J, Sorry, words to describe are different in every country :) What type of paint do you use and are your paintings on canvas or paper or ? Well, I usually paint in paper, but in this year i will start to paint on canvas with oil :) i'm almosto finish my first paint on canvas and i will put in the blog.